Later this year, Snet rolling out Network reach as well as exploring the possibility of high capacity i-network.These services will allow you to go online at speeds Up to 10Mbps. The upcoming SNet High Speed Internet for Home and Office services will utilize cutting edge technologies to deliver a richer, faster online experience whether you use the internet at home, in your office, or on the move. SNet High Speed Internet for Home and Office takes advantage of Fiber to the Home (FTTH) technology to bring you unlimited entertainment. 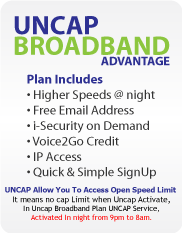 While current broadband connections can deliver network speeds between 384kbps and 1Mbps, UNcap can achieve speeds of 10Mbps to 100Mbps for consumers and up to 1Gbps for business subscribers. This is possible due to new fiber optic cable networks that are replacing the copper networks in Our Network.